Ramen Champion first opened its doors at Bugis+ in 2011, and has since garnered the attention of many ramen lovers as well as ramen chefs, who competing for the annual title of "Iron Chef". Amongst the six stalls which are currently helmed by professional chefs from different regions of Japan, is Buta God, or in English terms - God of Pork. 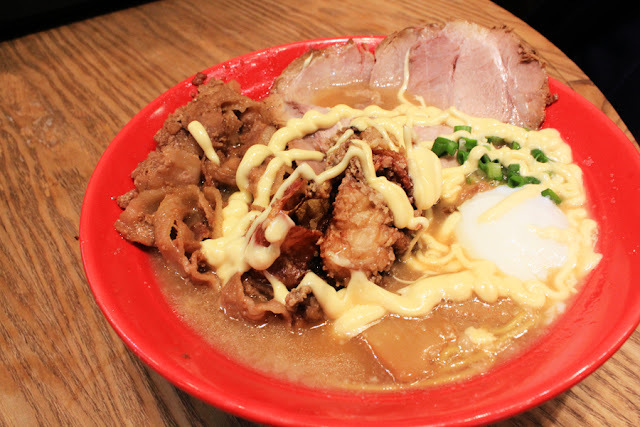 Hence, it is not surprising that tonkotsu (pork bone broth) ramen is their speciality and comes in all types of variants, such as their Tonkotsu Truffle Ramen, Fuwa-Fuwa (Cloud) Ramen, and even, Tom Yum Cheese Ramen (I wonder how this would taste). 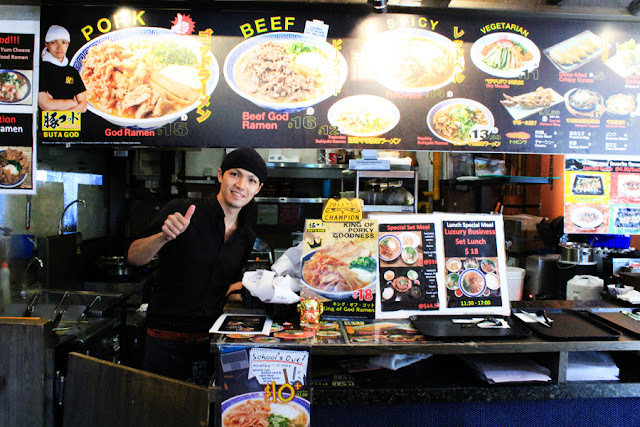 Here's my virgin experience at Buta God. ITADAKIMASUUUUUUUUU. King of God Spider Ramen (S$18) is one of their newest creation, which boasts an exciting combination of chasu, soft shell crab ("the spider"), a semi-runny egg done with perfection, and drizzled with Japanese mayonaise. The ramen noodles are al-dente (lim beh's country call this "QQ" - a nice springy texture) and absorbed the rich flavours of the broth really well. The mayonaise complemented the ramen and other ingredients really well, but was rather overpowering towards the end. Otherwise, this big bowl of ramen goodness is definitely fit for a god, and good to share among two small-eaters. Here's the chef behind all these brilliant creations. Featuring Chef Mamoru, a young Tokyo lad with years of experience creating fusing Japanese cuisine with delicacies from other cultures. Just check out the seasonal menus and be ready to be spoiled for choice. New dishes are created every few weeks or months, so you can always look forward to new options every now and then. 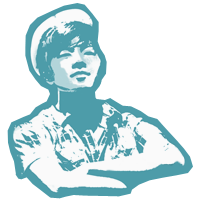 He was also the Ramen Champion for 2013, so keep a lookout for this young and rising star! Wah biang, he sibei cool right? Nevertheless, I will look forward to trying out other stalls at Ramen Champion, and then, decide on my vote for Iron Chef 2015. Jitao like election sia.